Once you have identified your thesis question and keywords for your research, test your topic by searching a broad, general resource such as JumboSearch or Google Scholar. These sources may help you understand the broader context of your topic and tell you in general terms what is known about your topic. They will give you an idea of how much and what kind of information is available on a given topic. If you are finding too much information and too many sources, narrow your topic; finding too few may indicate that you need to broaden your topic by using more general terms. Exploit existing bibliographies. Annual Reviews, Dissertations & Theses, and Oxford Bibliographies Online are database sources of literature reviews in specific fields. Sources cited in these bibliographies are good starting points for further research. When you’ve identified some useful titles, look these sources up in the Tufts Library Catalog. Check the subject headings listed in the subject field of these catalog records and then do searches using those subject headings to locate additional titles. Although Google allows you to search a whole sentence or phrase, most databases do not behave this way. You’ll need to select key phrases, words and concepts when searching databases. Use Boolean operators (AND, OR, NOT) and keywords in the Advanced Search mode for best results; they connect your search words together to either narrow or broaden your set of results. 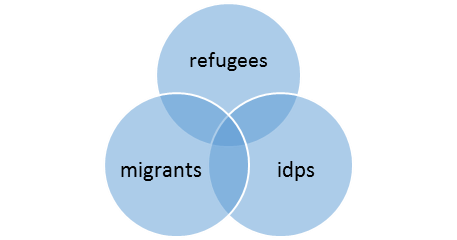 The triangle in the middle of the Venn diagram above represents the result set for this search. 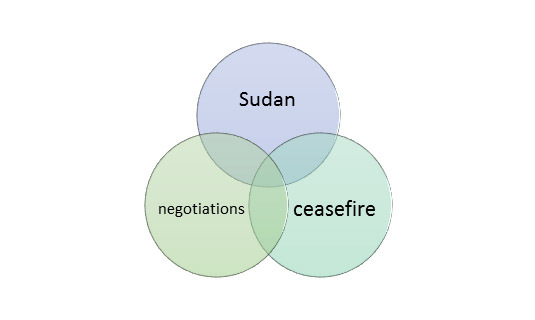 The search result records all contain the words Sudan, negotiations, and ceasefire. All three circles represent the result set for this search. It is a big set because any of those words are valid when using the "or" operator. Child* brings up child, children, childhood, and any other word that starts with the root "child." Globali?ation brings up items with the words globalization or globalisation. Similar to truncation, wildcards substitute a symbol for one letter of a word.